This issues’ cover bike is Porcelain (built by Ryan Burton)! Other featured bikes are Green with Envy (built by All Star Baggers); Tickled Pink (built by Livefast Cycles – Sheenan Leale); and Vintage (built by F Bomb Baggers)! Our tech shop is full with installs from Feuling, Dakota Digital, and Joker Machine! 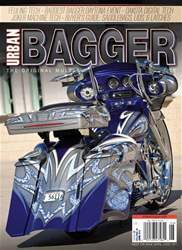 Events coverage includes The Baddest Bagger in Daytona at Bike Week; the Mark Brodie American V-Twin People’s Choice Custom Bike Show; and the World’s Sexiest Bagger Daytona 2018! Don’t miss our “New Products” section, as well as Buyer’s Guides: Saddlebags, Lids and Latches!